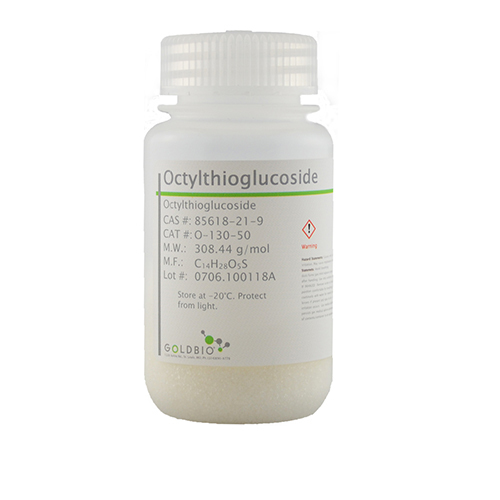 Octylthioglucoside is a nonionic detergent that has been used to isolate membrane proteins without inactivation. This product is effective in a variety of protein solubilization and cell lysis processes. And detergents of this nature are ideal when studying the conformation and structure of proteins because the secondary and tertiary structures remain intact. Compared to octylglucoside, octylthioglycoside is more stable. And it is stable in aqueous solution and easily removed by dialysis. This product is intended for use as a detergent to solubilize membrane-bound proteins in their native state. Saito, S., & Tsuchiya, T. (1984). Characteristics of n-octyl β-D-thioglucopyranoside, a new non-ionic detergent useful for membrane biochemistry. Biochemical Journal, 222(3), 829-832. Yoshida, M., Suzuki, A., Yamamoto, H., Noguchi, S., Mizuno, Y., & Ozawa, E. (1994). Dissociation of the complex of dystrophin and its associated proteins into several unique groups by n&dash;octyl β&dash;D&dash;glucoside. European journal of biochemistry, 222(3), 1055-1061. Tsuchiya, T., & Saito, S. (1984). Use of n-octyl-β-D-thioglucoside, a new nonionic detergent, for solubilization and reconstitution of membrane proteins. The Journal of Biochemistry, 96(5), 1593-1597.